All bogolan fabrics from Strawberries Fabrics are being produced on site from the very beginning, starting with the cultivation of cotton. After harvest, the cotton fibres are cleaned and combed and manually spun into thread. 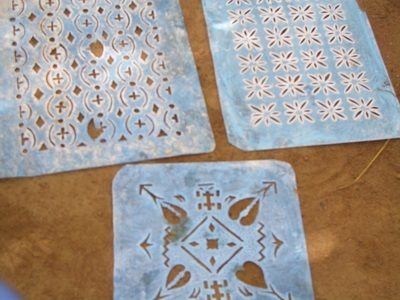 In the Dogon area, this is an activity which is traditionally done by elderly women. Because it is physically not very demanding it is therefore a welcome income generating activity for those that have difficulties participating in the heavy manual work on the fields and in the household. The spun thread is brought to the weaver, who manually weaves the cotton into long strips with a width of about six inches. 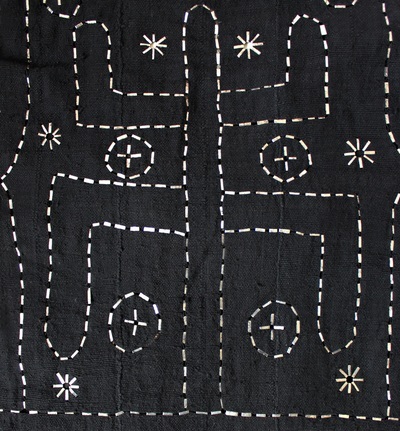 These strips are purchased by the bogolan producer who brings them to a tailor, who sews the strips together into a fabric with the desired width. The tailor normally uses a mechanical, small sewing machine. Only then does the ‘real’ bogolan work start. The producer soaks the fabric in a solution made with pounded seed from specially selected trees. 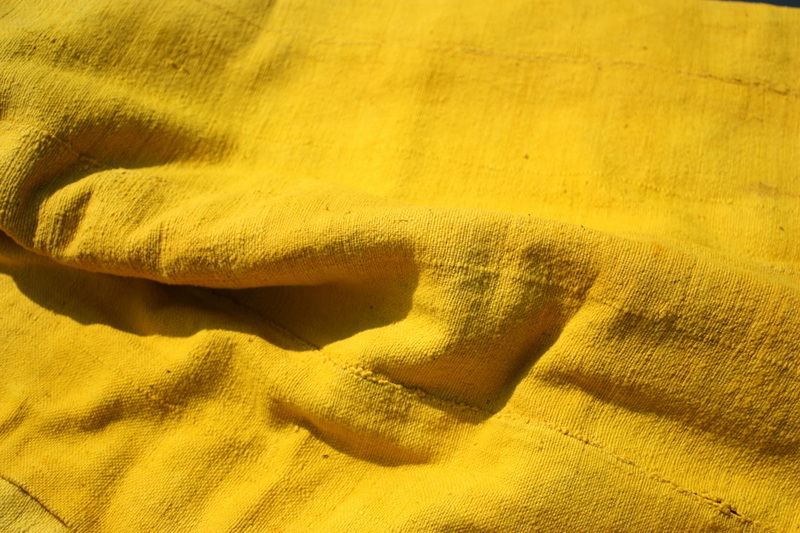 This gives a soft yellow colour to the fabric and serves to improve the capacity of the fabric to absorb the colours that are applied later on. 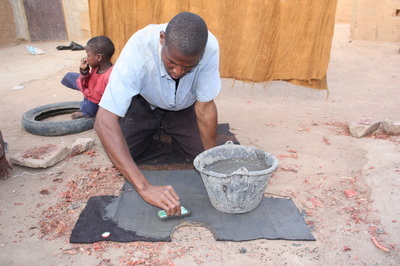 After drying, the fabric is again soaked in a special mixture of trees, bark, ashes and other natural ingredients. Every mixture will provide a different colour and the exact recipe is often secret and only passed on from father to son. A wide range of colours can be produced but for the darker colours several layers have to be applied subsequently. 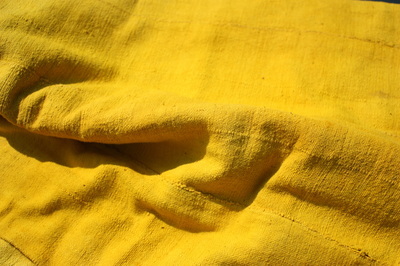 The fabric is spread out on the floor and dried again in the sun, so that the sunshine ‘develops’ the final colour. 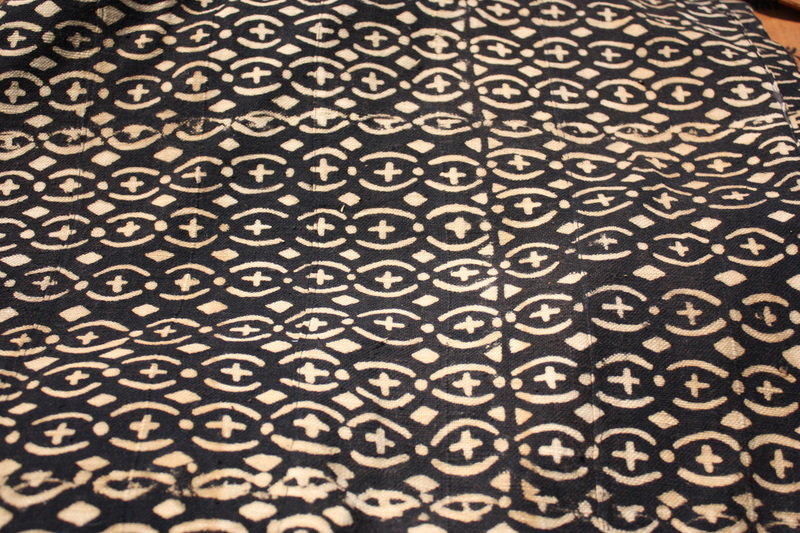 A real bogolan can therefore easily be distinguished from an imitation; the colours on the back side of the real one are much more muted than on the front. 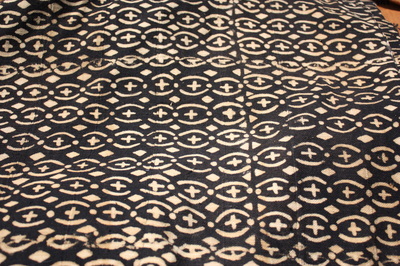 At this stage, only vegetative colours have been applied and some argue that therefore this can not yet be called a bogolan or mud-cloth, but rather a basilan. 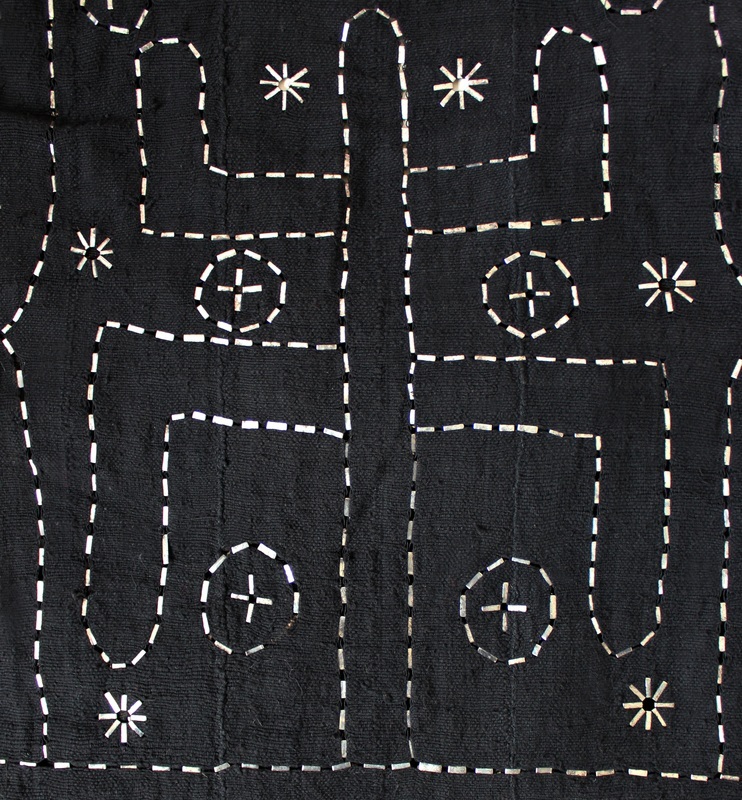 The “Union des Associations des Artisans de Bandiagara” unites over 20 organizations of specialized craftsmen and women groups, such as the bogolan producers, the indigo producers, the weavers, the carpenters etc. Strawberries Fabrics works with this Union, which ensures that the orders are divided evenly over the different producers. 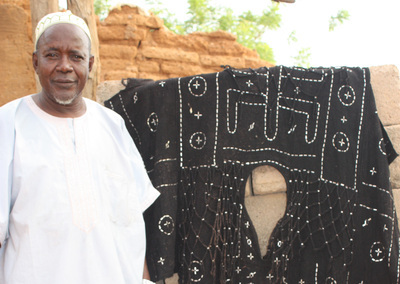 Total membership of the union (through the different associations) is over 3,000 - spread over the entire Dogon region. It is the mud, collected at special points in the river bed, which causes the black colour. This can be applied over the whole surface but is also used to make special patterns on the fabric, either directly by hand, using a stick or small pencil or by using a template, in which the design has been cut-out. Once the mud is dry, it can be wiped off, leaving the black patterns that make the bogolan. White patterns are created by applying a mixture of soap and a little bit of bleach (available to disinfect the hand wells) on the fabric, which bleaches the applied colours and gives the soft yellow colour from the beginning. Each producer has his own patterns, designs and colour combinations and many different variations of these wonderful fabrics are available!